Dose information is not a recommendation. These numbers may vary depending on individual tolerances. If you need help recovering from a substance misuse problem, we’ll find the right program for you. In the U.S. today, more people are dying every day each year from drug overdoses than they are from car accidents – a number that reached beyond 50,000 people in 2015: an all-time high. 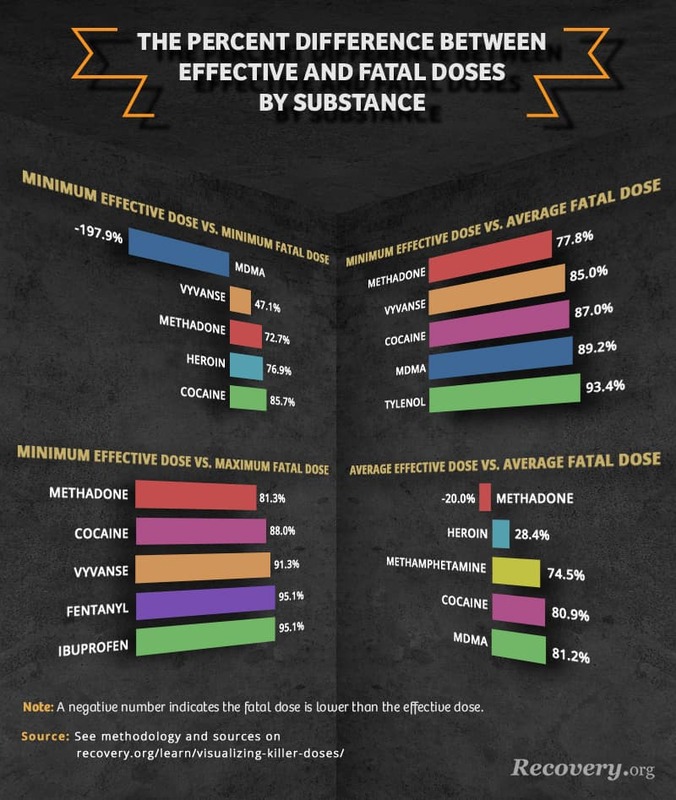 To understand this nationwide epidemic, we researched how much of each substance is needed to be classified as an effective dose (the amount of a drug or substance that is needed to achieve the desired effects), and how much of each substance produces the minimum lethal dose (the smallest amount of a substance that’d still be fatal to the person ingesting it) or LD50 (the amount ingested that killed 50 percent of test subjects treated with the drug). In many instances, we found conflicting reports on how much was required to achieve the desired result, and how much was too much for the human body to handle. In some cases where we found ranges of doses instead of individual numbers, we took the highest and lowest values in the range as two separate entries. As the number of deaths attributed to drug misuse continues to rise across the country, we explore just how important these variations in data can be for the millions of people currently addicted to dangerous substances. Continue reading to see what we discovered. Across the U.S., highly addictive opioids claim the lives of thousands of people every year. Fentanyl is one such synthetic opioid that saw more than a 72 percent increase in the national death rate between 2014 and 2015. Our research found conflicting reports on what might constitute as an effective dose and fatal dose of fentanyl – a drug that is 30 to 50 times as powerful as heroin. According to Drugs.com, the effective dose of fentanyl for medicinal purposes is identified as .0001 grams (or 100 mcg). Another site, Globalrph.com, says the effective dose is actually .00005 grams. Similarly, we found various reports of what may constitute a fatal dose of this dangerous substance – .002 grams and .003 grams. For perspective, like our photographs, research from this site includes a visual representation of .003 grams, to give you an idea of the minuscule difference between these reported numbers. When it comes to drugs in pill form, what they’re comprised of, and what they look like once diluted can vary significantly. On some online forums, when members ask how much MDMA they can expect to find in a single pill of Ecstasy, others respond the results can be as little as 50 milligrams and as much as 300. Others reply there’s truly no way to know for sure without a scale (if it’s in capsule form) or unless the drug is broken down and tested. 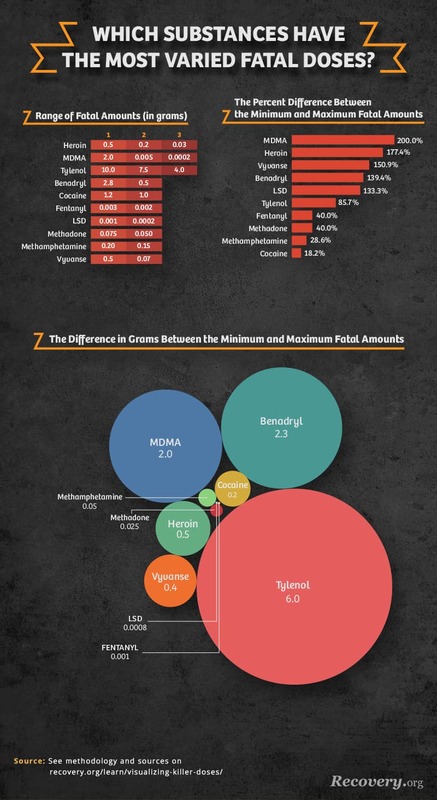 Where MDMA is concerned, we found fatal doses (LD50) could range from two grams to as little as somewhere between .00018 and .005 grams. Of the 18 substances researched, 11 reported multiple doses for either the necessary amount required for the desired effect or the amount that would be fatal. Three of these substances – heroin, MDMA, and Tylenol – were found to have three reported doses that are considered fatal, and one (methadone) had three reported doses that are considered effective. As our photographs illustrate, for some, the differences were dramatic, while for others they were hardly discernible. Among these, cocaine and methamphetamine reported a range of doses that could prove to be fatal: .15 grams to .2 grams (1 gram to 1.2 grams for cocaine). With such negligible disparities, the difference between the two doses is hard to discern with the naked eye. For methamphetamine, we found reports that as much as .06 grams could be required to achieve an effective dose, putting the difference between effective and deadly at .09 grams. Substances occasionally had overlapping differences between the minimum amount needed to be effective and the minimum amount that could prove fatal. MDMA – the primary ingredient found in drugs like Ecstasy (often referred to as Molly) – may be considered a “party” drug, but its effects can be deadly. While overdosing can include symptoms like loss of consciousness and seizures, the number of people who die each year from its consumption has increased significantly since 1998. Like other substances mentioned here, Ecstasy can be extremely volatile and is often laced with unknown substances (like fentanyl) that make it exceptionally dangerous to consume. As a response to this growing concern, companies have begun producing kits to test the purity of drugs being sold as Ecstasy to help users understand what may be hiding inside these substances. According to our research, the dose required for effectiveness was .125 grams – higher than the fatal dose reported here as a range of .00018 to .005. What Does a Fatal Dose Really Look Like? Of the drugs with varying online information regarding effective and fatal doses, some had major deviations between the dose information, while others were extremely minor. 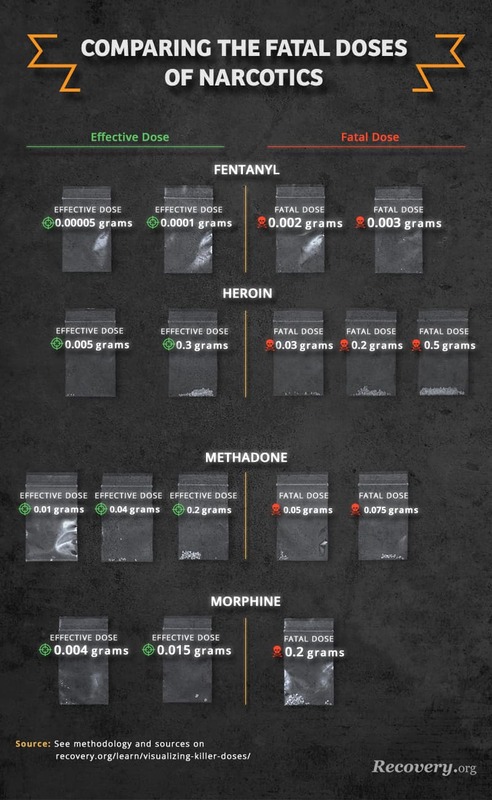 As discussed, the smallest doses of fentanyl represent the most potent drug studied. While one source reports the fatal dose for this synthetic opioid is just .002 grams, another reports only a fraction of a difference – .003. Among opioids, heroin had the largest variance in reported deadly amounts. We found sources that reported fatal doses at .03 grams and .2, to .5. The highest reported overdose amount is more than 10 times the lowest reported amount. . In 2016, the reported use of heroin reached a 20-year high, and the number of recorded deaths was five times the fatality toll in 2000. While drugs like Vicodin and Oxycontin have become harder to acquire, the availability and use of heroin have only increased. Not only is heroin a highly addictive substance, those who use it often develop a tolerance, which leads to higher doses in order to develop the desired effects. For those looking to understand how much they can realistically consume without dying, the variation in these resources can lead to fatal outcomes. To further complicate the issue, heroin (along with many other drugs) has been found, in some instances, to be laced with other, more powerful substances that can cause lethal overdoses. Our studies also found significant variations in the reported effective doses for methadone. Unlike heroin or fentanyl, methadone is a medication-assisted treatment (or MAT) that’s used to help people quit the use of addictive opioids and opiates. According to the NIH, the recommended length of treatment is a minimum of a year. However, like the other narcotics listed here, methadone can also be addictive and has negative side effects like difficulty breathing, hives, chest pain, hallucinations, and confusion. Variations in the recommended effective doses could potentially do more harm than good if taken outside the care of a licensed physician. Among substances with the largest variations in potentially fatal doses, Tylenol had the widest margin of error, with anywhere from four to 10 grams being noted as deadly. At its base, Tylenol is composed of acetaminophen, a pain reliever. Symptoms of overdosing can include abdominal pain, convulsions, coma, and vomiting and may not be present until 12 hours after consumption – making acetaminophen the deadliest over-the-counter pain reliever available in the U.S.. Between 2001 and 2010, more than 1,500 people died from such overdoses, but as many as 78,000 are hospitalized every year. Some reports have even found taking as many as five grams per day could be harmful to the liver, meaning the difference between a harmful dose and a safe one could be no more than two tablets of Extra Strength Tylenol. However, it’s important to note four grams (the lowest potential fatal dose we uncovered) would be twenty 200 milligram pills of Tylenol. Ten grams would be 50 pills, making it less likely that a person might accidentally overdose. As with any drug, a person’s weight and tolerance can impact the dose that is ultimately effective or lethal. While many sources reported variations (and sometimes overlapping figures) in their data, it’s possible that each is correct in some circumstances. The reality of how drugs will impact one person compared to another is contingent on a number of variables, such as their weight and physical health. The composition of the drugs can also impact fatal dose information. Our study found multiple instances where fatal consumption of one drug was secretly laced with or included other unknown substances. Consequently, the dose that works effectively for one person could be fatal to another. The misuse of these narcotics can be dangerous and complicated, but understanding how to detox your body after use can be difficult too. At Recovery.org, we guide you through your detox and cleansing options by connecting you with the right resources across the county. From holistic to medically assisted, we find the plan that works for your lifestyle and needs. Visit us online today at Recovery.org to learn more. We searched the web for details regarding the accepted effective doses and fatal doses of drugs. We attempted to find and verify these sources with secondary sources but were often presented with conflicting results. In an attempt to be as clear as possible, we’re visualizing all the information we found to show there are no exact numbers. LD50 is considered the lethal dose for 50 percent of the population. MLD is considered the minimum lethal dose. There is some controversy with these numbers and how they might pertain to humans as many are the result of animal testing. It’s difficult to know what doses might be lethal for an individual when factors such as weight and tolerance are taken into account. We hope to show there is a lot of misinformation in the world, so please take what you read on the internet with a grain of salt. Just because someone tells you a couple of grams is safe doesn’t necessarily mean it’s true for you.